Pet Readings 4 Mind-Readers outlines a fascinating and engaging personality profile reading system suitable both for beginners and more experienced cold readers. 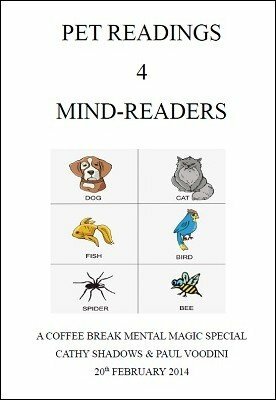 Devised by Cathy Shadows and expanded upon by Paul Voodini, this very special edition of Coffee Break Mental Magic describes in detail the actual reading method which is based around pet animals. Following these details, the manuscript goes on to demonstrate how the technique can be used to win over a table of guests at any kind of function in a matter of moments, to provide insightful and fascinating stand-alone readings, and to augment and enhance any kind of mentalism or magic routine. Pet Readings 4 Mind-Readers is a fun, engaging reading system that provides upbeat personality profiles. It is easy to master requiring absolutely no memory work, and yet is flexible enough and powerful enough to become an invaluable tool in any mentalist or magician's arsenal. Once you've read the PDF, you'll be wanting to go out and provide Pet Readings 4 Mind-Readers straight away! 1st edition 2014, 17 pages. I have the whole series of Coffee Break Mental Magic and look forward to each installment. Pet Readings is the best so far. I was hesitant but when I finished reading the manuscript all I could say was bravo! This is brilliant and a great way to get started with cold reading. The manuscript lays out the basic readings then goes on to teach several uses. This is a bargain and I highly recommend it. If you are an experienced cold reader then it might be a bit basic for you - but you still might find a nugget or two within the pages- especially the animal deck readings at the very end.